The global platelet-rich plasma market is growing at a rapid pace due rise in percentage of orthopedic and sports injuries, increase in the number of cosmetic surgical procedures, and surge in adoption about platelet-rich plasma therapies in the treatment of various chronic as well as acute disorders across the globe. The market was valued at US$ 195.2 Mn in 2017 and is projected to expand at a CAGR of 12.0% from 2018 to 2026 to reach US$ 543.5 Mn by 2026. The global platelet-rich plasma market is driven by surge in adoption of technologically advanced products and high prevalence of osteoarthritis, rheumatoid arthritis, juvenile arthritis, and other disorders. Platelet-rich plasma (PRP) is referred as blood plasma-derived product. PRP contains an elevated level of platelets and growth factors (at least four to eight times) than normal blood concentration. PRP is used to treat various chronic conditions because of its effectiveness in accelerating wound healing. The three basic types of platelet-rich plasma are pure platelet-rich plasma, leukocyte-rich platelet-rich plasma, and pure platelet-rich fibrin. Platelet-rich plasma is widely used in various plastic and cosmetic surgical procedures, orthopedic surgical procedures such as knee join disorders, and to heal chronic wounds. Platelet-rich plasma can be produced using three distinct sources: autologous platelet-rich plasma, allogeneic platelet-rich plasma, and homologous platelet-rich plasma. The global PRP market is driven by increase in the number of orthopedic surgeries and sports injuries, rise in the number of cosmetic surgeries, approval of new devices and discovery of new application areas, and surge in awareness among the global population. According to statistics provided by the International Society of Plastic and Aesthetic Surgeons (ISAPS), 11 million non-invasive cosmetic procedures were performed across the world in 2013, including 3.0 million dermal filler procedures. According to the American Association of Orthopedic Surgeons, the obese population is 20 times more likely to undergo knee replacement surgery compared to those who are not overweight. Significant rise in the number and demand for cosmetic surgery procedures across the globe is expected to propel the platelet-rich plasma market during the forecast period. PRP therapy is a widely used technique in cosmetic surgeries. Additionally, PRP therapy can be used as dermal filler for rapid healing of injuries and is an effective substitute for hyaluronic acid. However, high cost of devices & therapy and threat of therapy failure are factors hampering market growth. Advances in technology and devices will open new avenues for the global players operating in the platelet-rich plasma market. Use of PRP technology and products for the treatment of chronic diseases such as orthopedic diseases, cardiovascular & neurovascular diseases, general surgery, wound management, and cosmetic surgeries is increasing. Moreover, innovations in PRP technology such as changes in the production protocol (time and RPM/centrifugal force), output level (volume and concentration above baseline), and companies investing in research and development to develop new PRP applications and devices are expected to present significant opportunities in the platelet-rich plasma market. Recent studies have demonstrated the effectiveness of ultrasound technique in combination with platelet-rich plasma method in treating osteoradionecrosis of the jaws (ORNJ). An article published by the Journal of Medical Hypotheses and Ideas in March 2015 stated that basic fibroblast growth factor (bFGF) delivery through low-frequency sonophoresis (LFS) combines ultrasound with bFGF to synergistically accelerate ORNJ healing. The ultrasound and platelet-rich plasma therapy combination is another new approach studied for the treatment of various orthopedic disorders. The global platelet-rich plasma market has been segmented based on type, origin, application, and region. In terms of type, the global market has been classified into pure platelet-rich plasma, leukocyte-rich platelet-rich plasma, and pure platelet-rich fibrin. The pure platelet-rich plasma segment dominated the global market in 2017 and is projected to gain market share by 2026. This is attributed to widespread use in various applications and rich content of platelets. However, higher number of growth factors that promote rapid healing of injuries is likely to drive the L-PRF segment in the near future. Additionally, cost effective platelet derivative, rich content of stem cells & leukocytes, and high efficiency to treat diseases such as tendons & ligament injuries and neurological diseases are the other factors fueling the growth of the L-PRF segment. Based on origin, the global platelet-rich plasma market has been divided into autologous platelet-rich plasma, allogeneic platelet-rich plasma, and homologous platelet-rich plasma. The autologous PRP segment accounted for the largest market share in 2017. Dominance of the segment is attributed to ease of production, cost-effectiveness, and lowest threat of disease transmission. However, the allogeneic PRP segment is anticipated to witness strong growth during the forecast period owing to high concentration of growth factors and reduced time of wound healing. In terms of application, the global platelet-rich plasma market has been classified into orthopedic surgery, neurosurgery, cosmetic surgery, general surgery, and others. Orthopedic surgery was the largest application segment in 2017. The segment is driven by high prevalence of orthopedic diseases and promotion of PRP technique by various sports personalities. PRP products are widely used in cosmetic surgeries to improve facial esthetics, enhance the rate of injury healing, and modify facial structure (vampire facelift treatment). Additionally, cosmetic surgeries performed with the use of PRP products modify the facial esthetics in a short time due to reduction in the healing time. Hence, the cosmetic surgery segment is likely to expand at the highest CAGR during the forecast period from 2018 to 2026. Based on region, the global platelet-rich plasma market has been segmented into five major regions: North America, Europe, Asia Pacific, Latin America, and Middle East & Africa. North America accounted for a dominant share of over 40% of the global market in 2017. The region’s large market share is attributed to high prevalence of orthopedic diseases, increase in demand for cosmetic surgeries, approvals of various PRP systems by the U.S. FDA, and surge in awareness among the patient population. According to the American Society of Plastic Surgeons Report, around 17.5 million surgical and minimally-invasive cosmetic surgeries were performed in 2017 in the U.S., an increase of 2% over that in 2016. Europe held a prominent share of the global platelet-rich plasma market in 2017. The platelet-rich plasma market in Asia Pacific is projected to expand at a rapid pace during the forecast period owing to surge in investment in health care infrastructure, rise in per capita health care expenditure, large population base with chronic wounds & orthopedic disorders, and expansion in the distribution network of leading players in the region to establish themselves in the lucrative market. Major players operating in the global platelet-rich plasma market are adopting the strategy of distribution agreement and strategic partnership with leading players in the market. These distribution agreements are aimed toward strengthening presence in the international market. Key players operating in the global market include Harvest Technologies Corp. (Terumo Corporation), Arthrex, Inc., Zimmer Biomet Holdings, Inc., EmCyte Corporation, Regen Lab SA, Exactech, Inc., and Cesca Therapeutics, Inc., Nuo Therapeutics, Inc., DePuy Synthes (Johnson & Johnson), ISTO Biologics, and AdiStem Ltd. This report studies the current as well as future prospects of the global platelet-rich plasma market. Stakeholders of this report include companies and intermediaries engaged in the manufacture, commercialization, and provision of platelet-rich plasma and new entrants planning to enter the market. This report comprises an elaborate executive summary along with a market snapshot providing overall information of various segments considered in the scope of the study. This section also provides the overall information and data analysis of the global platelet-rich plasma market regarding leading segments based on type, origin, application, and region. The global platelet-rich plasma market has been segmented based on type, origin, application, and region. In terms of type, the global market has been classified into pure platelet-rich plasma, leukocyte-rich platelet-rich plasma, and pure platelet-rich fibrin. Based on origin, the global platelet-rich plasma market has been categorized into autologous platelet-rich plasma, allogeneic platelet-rich plasma, and homologous platelet-rich plasma. In terms of application, the global market has been divided into orthopedic surgery, neurosurgery, cosmetic surgery, general surgery, and others. The market revenue for each type was estimated using bottom-up approach. The revenue generated by each type and application has been calculated considering sales, usage data, and pattern in different regions. The bottom-up approach for determining the country market size was studied using various market indicators obtained from secondary sources, which include different types and origin of platelet-rich plasma and their cost variations in major country/region; prevalence and incidence in major countries for orthopedic disorders, sports injuries, arthritis, and other major diseases, and other treatments such as cosmetic surgeries and plastic surgeries for which platelet-rich plasma are used. Revenues of all publicly listed market players were obtained through secondary sources and analyzed for platelet-rich plasma systems specific revenues by narrowing down to revenue percentage for product segment through extensive secondary analysis of annual reports, investor presentations, press releases, primary interviews, and others. Data triangulation is based on secondary research (top-down and bottom-up approaches) and primary research. Moreover, historical year-on-year growth has been taken into consideration while estimating the market size. The market size and forecast in terms of US$ Mn for each segment has been provided for the period from 2016 to 2026. The report also provides the compound annual growth rate (CAGR %) for each segment for the forecast period from 2018 to 2026, considering 2017 as the base year. 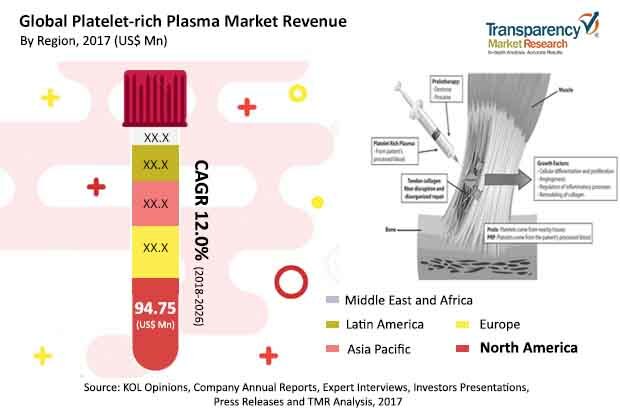 The market overview section of the report explores market dynamics such as drivers, restraints, opportunities, and key trends that have a strong impact on the platelet-rich plasma market and could influence it in the near future. Market attractiveness analysis has been provided to explain the intensity of competition across different regions. The competitive scenario among different players is evaluated through market share analysis in the competitive landscape section of the report. These factors are likely to help market players take strategic decisions to strengthen their positions and expand their shares in the global platelet-rich plasma market. In terms of region, the global platelet-rich plasma market has been segmented into North America, Europe, Asia Pacific, Latin America, and Middle East & Africa. The market size and forecast for each of these regions has been provided for the period from 2016 to 2026, along with their respective CAGRs for the forecast period from 2018 to 2026, considering 2017 as the base year. The report also provides market size and forecast for major countries with each product and distribution channel in the respective region. A detailed qualitative analysis of factors responsible for driving and restraining the market and future opportunities has been provided in the overview section. This section of the report also provides the market attractiveness analysis and market share analysis by key players, thereby presenting a thorough analysis of the overall competitive scenario in the global platelet-rich plasma market. Major players operating in the global platelet-rich plasma market are Harvest Technologies Corp. (Terumo Corporation), Arthrex, Inc., Zimmer Biomet Holdings, Inc., EmCyte Corporation, Regen Lab SA, Exactech, Inc., and Cesca Therapeutics, Inc., Nuo Therapeutics, Inc., DePuy Synthes (Johnson & Johnson), ISTO Biologics, and AdiStem Ltd.